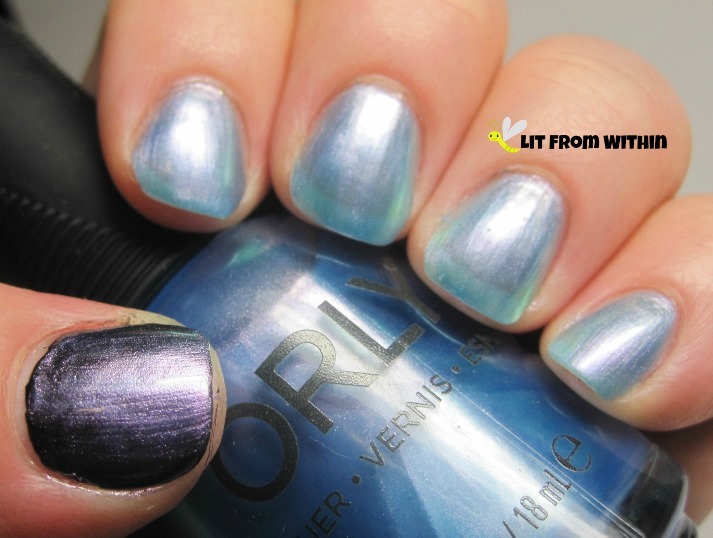 Lit from Within: This new Orly collex is...Surreal! Fall is coming, and a lot of the Fall collections have started coming, too! I picked up a few of the Orly Surreal collex that I thought looked interesting. Angel Rain is a sheer blue with a purple shimmer. My pix show three coats, and there's still VNL, though in Real Life it isn't as visible. I figured this would be great layered over a dark color, so it's over OPI Black Onyx on my thumb. The purple really comes through over black! By itself, it's light and dainty, and the shimmer is more evident than I could capture with my camera. I do suspect that those who either don't like layering or don't know about it might be disappointed with the sheerness of this polish. 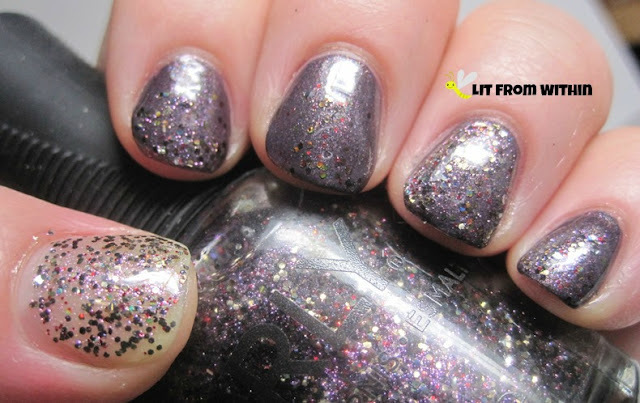 Pixie Powder is purple and gold glitter and purple shimmer in a clear base. It really isn't dense enough to wear alone, so I layered it over the Angel Rain. The ring finger is a full nail of glitter, the rest have a gradient. It's very dainty and pretty, and in this slightly blurred pix, you can see how the gold holo glitter sparkles, and that purple shimmer builds up on the ring finger. I think it just looks amazing. 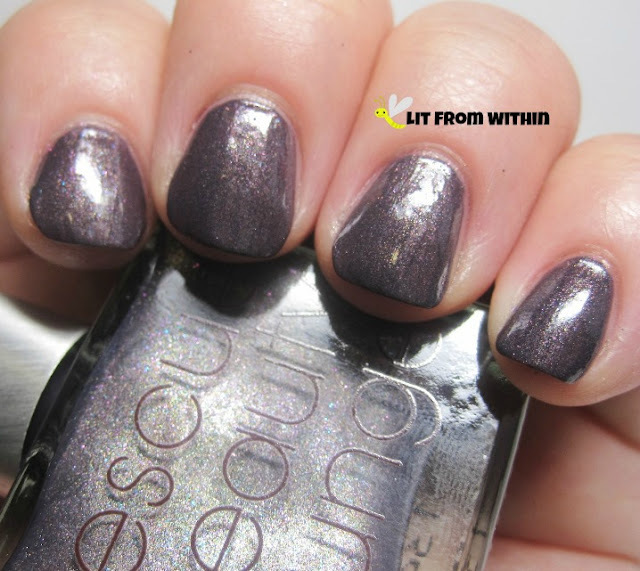 The last polish I have for you needed undies, so I busted out my first Rescue Beauty Lounge polish, Catherine. It's a dark plum with a subtle shimmer. Great, easy formula, too. I layered Digital Glitter over the entire ring finger and did another gradient on the other fingers. The thumb is Digital Glitter by itself so you can see it a little better. 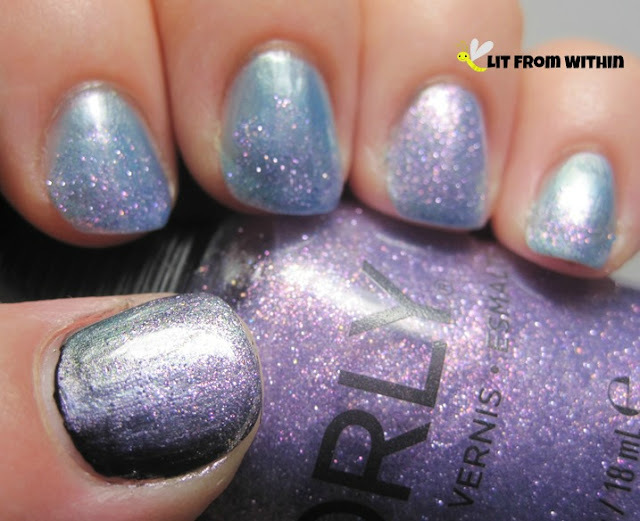 It's gunmetal, holo, and purple glitters in a clear base with a purple shimmer. I sense a purple theme. That purple shimmer is so beautiful, it makes all these manis just glow. 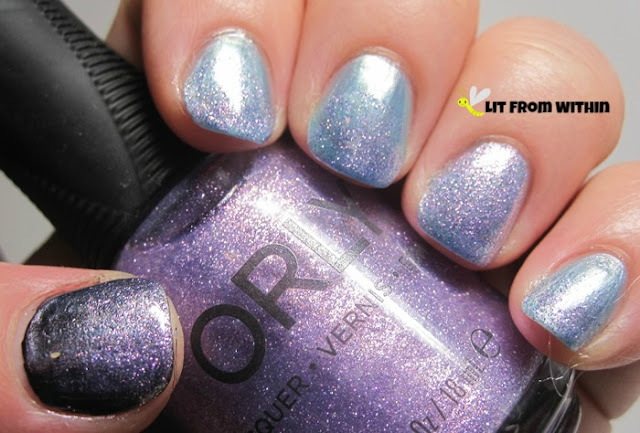 All of these Orlys, even the glitter, had really nice application. I don't particularly like the new bottles that much, but I love the grippy cap, which makes up for it. If you'd like more info about Rescue Beauty Lounge, you can find them on Facebook and their website. Are you ready for Fall? I'm so ready for Fall nail colors, especially these purples! Maybe I'll pick up the cremes later, but I had to have the glitters! I was hoping for another Sparkling Garbage.. not quite, but they are still pretty.